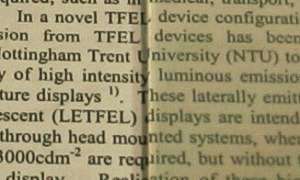 This experiment was inspired by an article by F. J Stone, which appeared in the November 1969 edition of Practical Electronics magazine. The availability of transparent conductive glass should make some interesting experiments possible, particularly with electro-optic devices. All that is required is a hot plate, some ordinary window glass, a glass cutter and some stannous chloride powder. I obtained 250g of stannous chloride powder through a local chemist. 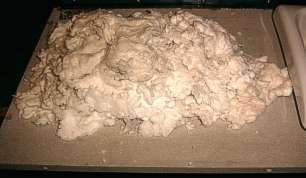 The stannous chloride powder must be kept in an air tight bottle because it is very hygroscopic (absorbs water) and as a result tends to form into solid lumps. It is important that this experiment is conducted well away from food and food preparation areas. Stannous chloride is harmful and contains tin which can cause tin poisoning. The vapour must not be inhaled. 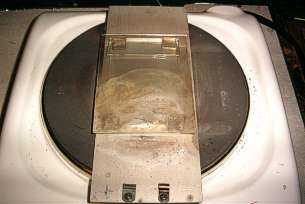 Once the hot plate has been used for this experiment, it should not be used for cooking food. There is also the obvious hazard of high temperatures which could cause burns or start a fire. First, the glass to be made conductive must be cleaned. I first clean it with toothpaste because it is a mild abrasive. I then wash it in warm soapy water, then isopropyl-alcohol and then distilled water. Finally I dry it with warm air. I place a rectangular sheet of aluminium on a normal electric cooking hot-plate. This one is a Criterion type 0318 which is 1500W. The type is not particularly important, but it needs to get up to around 400C. I use the aluminium sheet so that the glass is heated more evenly and can be lifted off with a large pair of pliers while it is still hot. It can then be placed in insulating glass wool to cool slowly. The glass to be made conductive is placed on the aluminium sheet. It is the top surface which will become conductive. This piece is 65mm by 103mm and 2mm thick. 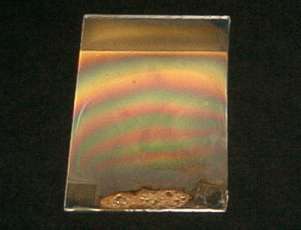 Two pieces of glass about 1cm square are then positioned on top of each other at each corner. Here I wanted a non-conductive region at one end, so I positioned a rectangular piece of glass as a mask and then two small pieces on top. A small pile of stannous chloride is then made between the two glass squares at the front. A second, slightly larger piece of glass is then placed on top to form a sandwich, with a 4mm air gap in the middle. This top piece of glass has been used several times before, which is why it is stained white and brown. The hot-plate is then turned up to full heat. The clips at the front of the aluminium plate are where I had a thermocouple attached to measure the temperature. At full heat, this hot-plate reaches 430C. As the stannous chloride is heated it goes through a number of distinct phases. First it liquefies as in the photograph below. Then it boils and turns back into a white powder. I think it is actually absorbed water which is boiling off at this point. When it gets much hotter, it turns into a liquid again and becomes slightly yellow. Finally, it starts to smoke. At this point I blow the vapour very gently through between the glass plates. I keep doing this until it stops smoking. When it has stopped smoking, I lift the aluminium sheet off the hot-plate and place it in a pile of glass wool to cool slowly. During my first attempt I allowed the glass to cool on the hot plate. It fractured violently during cooling and the two halves went in opposite directions. Burying it in thermally insulating glass wool allows it to anneal as it cools, relieving the stresses. The 1cm square glass separators and the top sheet of glass can be used many times. This is the glass after it has cooled. It is now conductive except for the rectangle at the back where it was masked. 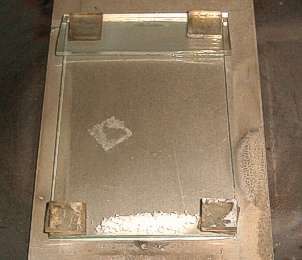 The area at the front where the stannous chloride was can be removed using a glass cutter. The central area measures about 1.1kΩ per centimeter with pointed probes. The conductive film is actually tin oxide and is even harder than the glass. It is well adhered and can not be scratched off. Lower resistance films are achievable by repeating the process. This picture should give an idea how transparent the conductive glass is. The glass covers the right hand area of the text. Modern conductive glass is often made using indium tin oxide, which provides high electrical conductivity and optical transparency.